Adjustment and digital display of profile size from 80 up to 2800 mm. Powder spray painted aluminum and steel-made structure for higher resistance to corrosion. Independent adjustment of piece lock pressure and blade movement. Thermic protection of the motor and low voltage control circuit. 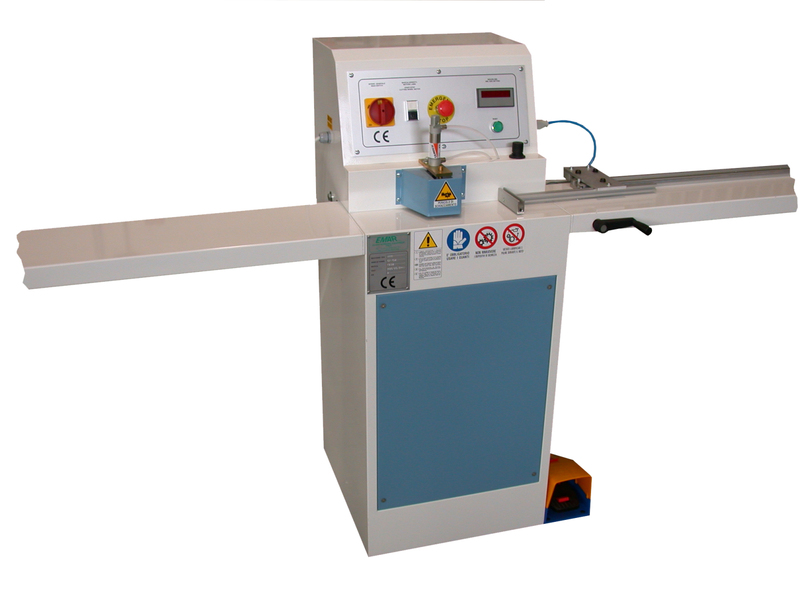 All electronically displayed cutting operations achieved without leaving the control zone because the size setting is achieved by means of a handwheel on the body of the machine. Possibility to have simultaneous cutting of more than one profile (5 pieces of 6 mm). Emergency push button to stop all moving parts of the machine. The stop system of the profile to be cut operates before that the blade moves so that to cover completely the exposed cutting part and to lock the piece to be cut. Control system with safety pedals. All control circuits which are in contact with the operator are in security low voltage 24 Vac. Safety protections against access to the dangerous parts of the machine according to the European norms.